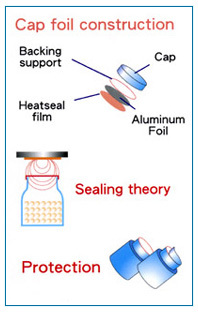 foil attached on the cap (such as FDA approved inner seal) is. ng machine reduces production and management costs. P Series One piece Glass,PE Easy-Peel Glass(liquid, powder)Insecticides, Chemical resistance(liquid, powder)Juice, Fresh milk, power(drug, food)Cometic products, Edible Oil. Glass,PE,Metal Glass(liquid, powder)Insecticides, Chemical resistance(liquid, powder)Juice, Fresh milk, power(drug, food)Cometic products, Edible Oil. PE、Glass,Metal Glass(liquid, powder)Insecticides, Chemical resistance(liquid, powder)Juice, Fresh milk, power(drug, food)Cometic products, Edible Oil. PE、Glass Glass(liquid, powder)Insecticides, Chemical resistance(liquid, powder)Juice, Fresh milk, power(drug, food)Cometic products, Edible Oil.